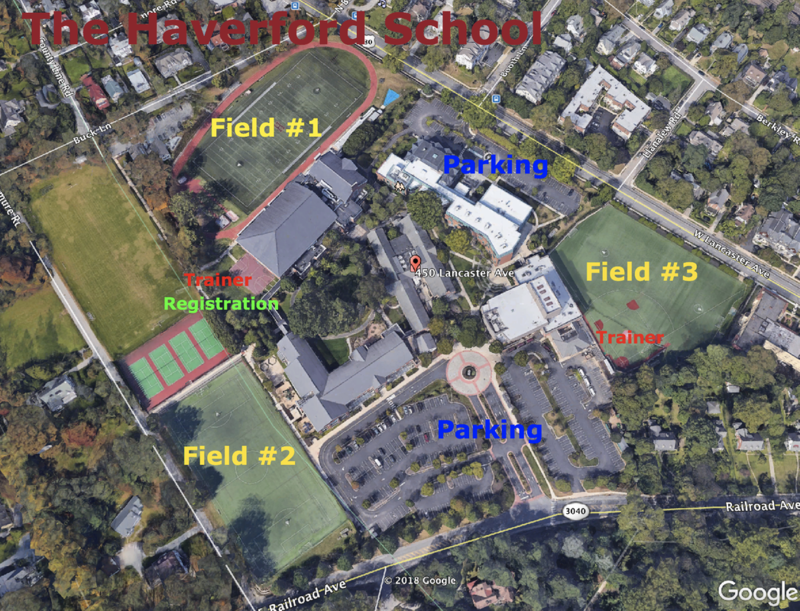 The Fall Haverford Invitational will feature 12 of the top high school teams in the country for a play day. Each team is required to have at least a 20 player roster. If a team does not, the team will be asked to pay the difference. Players may now voluntarily leave their feet and enter the crease to score a goal. The ball must enter the goal before the player touches the crease to count. Players must be moving in a direction away from the mouth of the goal. Players leaving their feet towards the goal mouth will be flagged for a 1-minute penalty. Games are 50 minutes running time, comprised of two 25 minute halves and a 2 minute halftime. 20 seconds to advance the ball across the midline, but there will be no shot clock. One 30 second timeout is allotted per team, but it can't be called under 5 minutes in the 2nd half - game clock continues to run. Mesa Lacrosse is proud to partner with HBC Event Services, a travel/booking agency with a nationwide reputation for excellence in managing travel for sports events. HBC Event Services provides an easy way for you to book your hotel rooms with our partnered hotels at the best rates. These rates are always the same, if not lower than, their best available rate and usually includes breakfast for your team. HBC Event Travel Services guarantees that if the tournament is cancelled due to weather, you will not be charged for any cancellation penalties that you may otherwise have been subject to if you made your reservation elsewhere. This guarantee does not include hotel reservations made after the hotel cut off dates. Mesa is partnering with SportsRecruits, US Lacrosse’s Official Service Provider for Recruiting, who will be onsite this year with Film & Recruiting packages available for all players in attendance. These event-specific packages include HD game footage of your games filmed by professional videographers. Select packages also include access to the SportsRecruits online platform that has proven to successfully help thousands of players find success in the recruiting process. Convert tournament to a “festival” format without playoffs or championships to provide the majority of teams the opportunity to play as many games as possible. The directors of Mesa Lacrosse reserve the right to cancel, shorten, or reschedule tournament games due to inclement weather, poor field conditions, player and fan safety concerns, or at the direction of The Haverford School. No refunds will be granted if these actions are necessary. Field directors will communicate game changes. Schedule changes will be available on-line at MesaLacrosse.com. If thunder or lightning is observed play will be suspended immediately and players and fans will be asked to leave the fields and return to their cars. Play will be allowed to resume 30 minutes after the last sound of thunder or sighting of lightning is observed which will be determined by the tournament medical staff. Every attempt will be made to begin subsequent games on time. Subsequent games will begin immediately after preceding games. These games may be shortened. Once games are back on schedule they may revert to “normal” tournament game time procedures. Mesa Lacrosse will refund all but $500 for any team that registers and withdraws from the tournament prior to November 1st of the year of the tournament. No refund of any kind for any team that registers and withdrawls anytime on or after November 1st of the year of the tournament. No refunds will be issued if the tournament is shortened in part for any reason, including inclement weather. No refunds will be issued for playoff or championship games that are canceled due to weather. Mesa Lacrosse, its officers, employees and staff will not be responsible for any expenses incurred by any team, club or organization if the tournament is canceled in whole or in part. The Tournament along with local County or school officials reserves the right to decide on all matters pertaining to the operation of the tournament and its judgment is final. Only currently registered players on MesaLacrosse.com, for the specific tournament and who agree to the “Release and Waiver of Liability, Assumption of Risk, and Indemnity and Parental Consent AGREEMENT,” may participate in tournament games. It is the coach’s responsibility to ensure all of his team members are registered. This can be confirmed on the Player Page for each tournament. Philadelphia Fever will notify a coach if a player did not agree to the Release and Waiver of Liability, Assumption of Risk, and Indemnity and Parental Consent AGREEMENT. Tie breakers will be determined for division depending on the number of teams participating in the respective division. Tie breaker information will be available on MesaLacrosse.com no later than one week prior to the tournament. Each field is assigned a Field Timer who will keep score. Coaches should check the score on the field if they wish to validate or challenge a score. Any challenges must be made immediately following the game with the Field Timer, who will contact a tournament administrator to address the issue. Once the score reaches the administration tent the score is considered final.